A beautiful venue in the heart of Italy, with all comforts, wonderful studio with wooden floor and large windows all around with stunning views of the Italian landscape, large swimming pool (7x14m), restaurant with excellent kitchen and surrounded by a park with woods and fields and with spectacular 300 degree views of the strolling hills and the Sibillini Mountains. 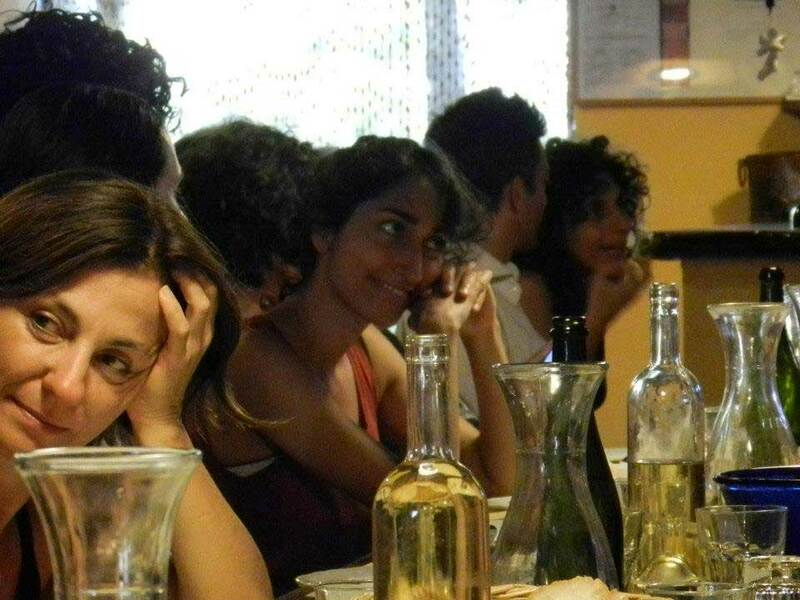 Discover Italy through an hand-on cooking course, dancing the all night, enjoing italian sun in a relaxing and informal atmosphere, in a fantastic location with fun and new friends. During the week you have tango & yoga for dancers workshops, on mornings from 10.30-12.30 and on evenings from 16.30-19.30. Workshops start usually on Friday evening and end on Friday. 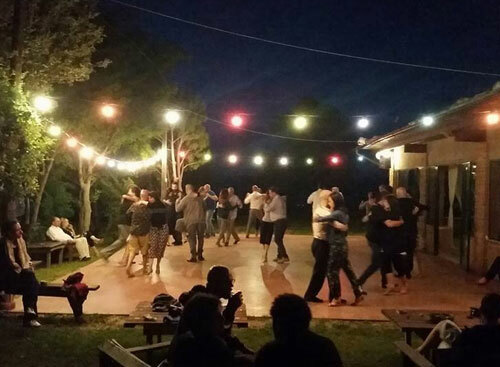 After the evening workshop and the dinner there is milonga/salon dancing until late. In the afternoons, and during the all day you can use the dancefloor for private lessons or to practice. A Tango School with a View! Next to the holiday villas lies a covered wooden dancefloor with a view on the valley and the the Sibillini Mountains on the backdrop. On this intimate, "living" dancefloor we can receive dancers from everywhere, local friends or from Holland, Germany, Belgium, Denmark, Sweden, Norway, U.K., Austria, Switzerland, France, Italy etc. Because of the international character of our tangoweeks, workshops are mostly english spoken.
" It is difficult to convey to others how great this stay was, your generosity and hospitality were beyond our expectations, thanks! " . 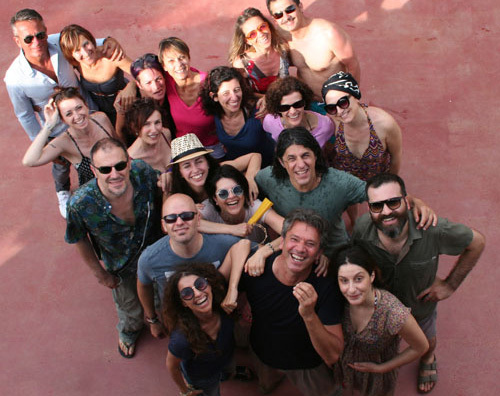 This is the link to the website dedicated exclusively to the Caravanserraglio agriturismo. 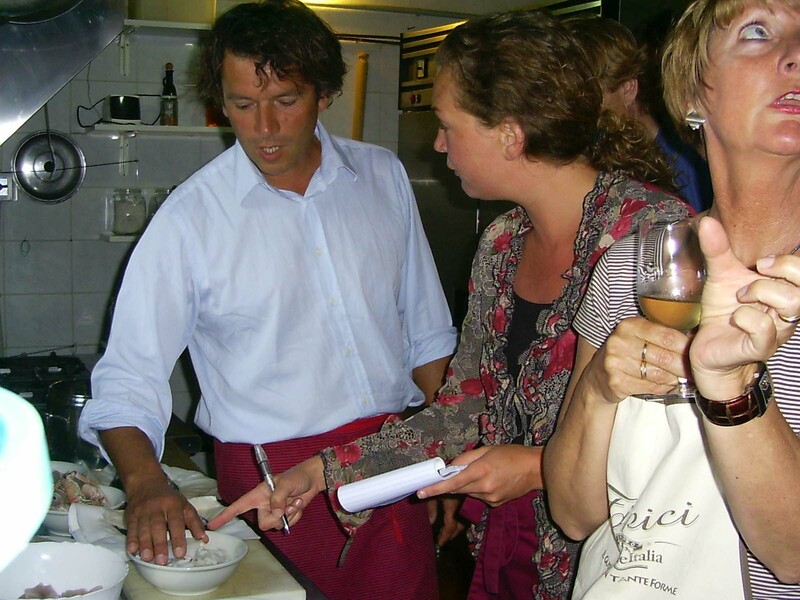 We have been guesting people and organizing Cooking and Art Holiday Courses for the last 20 years, this is the link to the website dedicated to the Italy Art Tours and Cooking Holiday Courses. 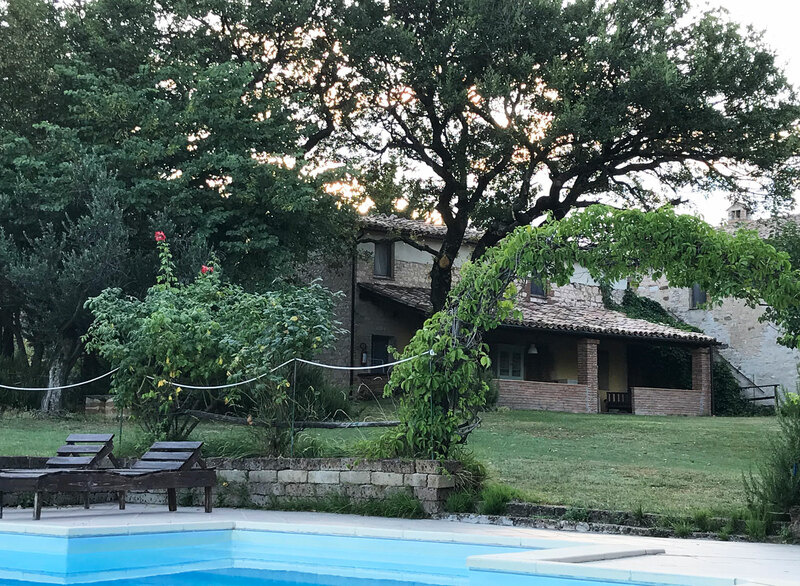 For a selection of Holiday Villas and Apartments with pool in Marche Italy visit our website Le Marche Holiday. If you and your friends are more than twenty we can organise private dinner parties with a live cooking show and your choice of music. In case of more than 35 participants, dinner will be standing only. 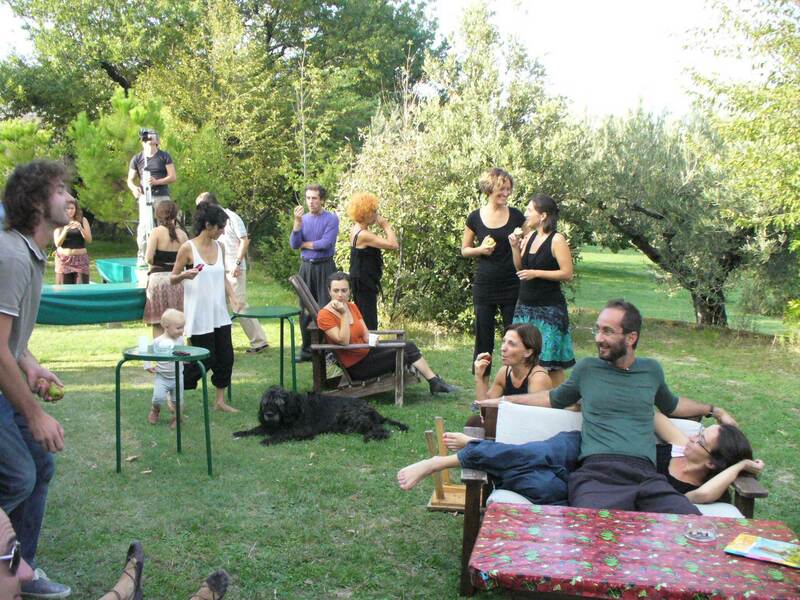 We´re proud to invite you to taste real homemade food in our paradise in the heart of Italy. 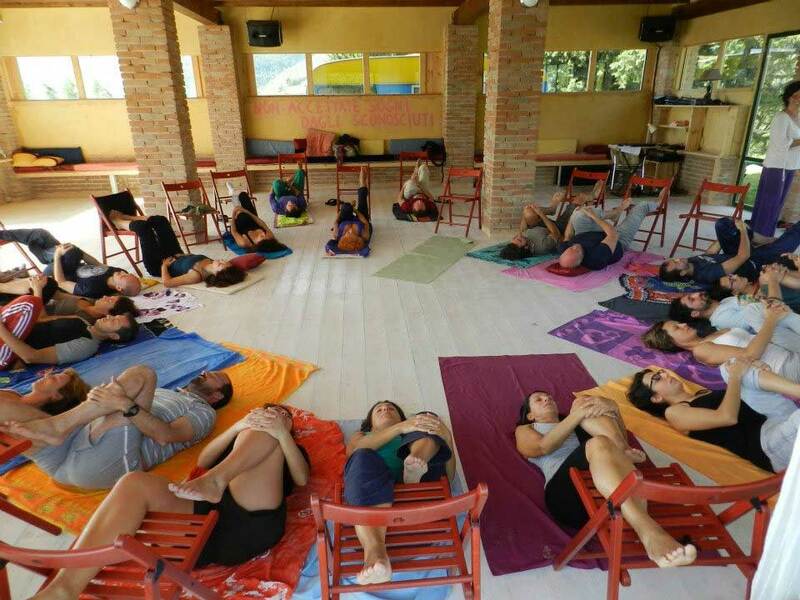 Try out this new way to go out, take a break and live a unique social experience in our place. So come and make our living room even more lively. You don't need to be a Masterchef to join the class. During the evening a professional chef will show you how to cook the programmed meal. You can participate by helping the chef, cooking under his guidance, or choose just to watch and take notes. It's up to you. Once everything is ready you'll sit at the table to taste all the dishes together with the chef.